We understand that researching for a place to stay on your school trip can take hours or even days out of your week. There’s lots to consider. So, we’ve done all the research and put it together in one place to help you choose the right school group accommodation. DON'T HAVE TIME TO READ THE GUIDE NOW? For those who don’t have time to read the full article right now, we’ve created a PDF version for you to read when you get a quiet moment. Finding school group accommodation that's safe and reliable is top of your priority list as a teacher or group leader. You need to relax in the comfort of knowing that every one of your children are safe and sound at all times of the day and night. There are several things that a school trip organiser should be looking for when choosing where to stay. It's the little things that make a big difference when it comes to your children's safety and your peace of mind. Is there CCTV on site? Does the accommodation have electronic key card access to the rooms? Is a 24-hour reception with access to a first aid kit provided? We all know that things never go wrong at the right time. "WHEREVER WE STAY HAS TO TAKE THE SAFETY OF EVERYONE IN OUR GROUP AS SERIOUSLY AS WE DO." As for luggage, it’ll be essential to pick accommodation with secure storage that you don’t have to think twice about while you’re out and about during the day. We all plan ahead, but something or someone will always stray from the plan. You'll need friendly, understanding and available staff members to assist you and the young people in your care. Let’s face it, school trips are a total treat for kids. Not only are they released from the constraints of the classroom, but they also get a taste of freedom - with their friends and without the ever-watching eye of their parents. So, you’ll want to stay in a fun, vibrant environment with plenty to do. However, picking a location that’s perfect for its educational hotspots is key. We understand that not only do you want a place that’s got enough activities to keep the children entertained – you will have your curriculum in mind too. The location you decide on will also need to give your school group a fulfilling learning experience. And it's worth remembering that the great outdoors is often the best classroom. "WE ALWAYS HAVE AN EDUCATIONAL ELEMENT TO EVERY TRIP WE GO ON. KEEPING EVERYONE INTERESTED IS A BIG CHALLENGE." As a group leader, the educational value of the location you choose will - of course - be as important as how much fun they can have. For Science trips, you may be looking for zoos, wildlife centres or National Parks. For Art trips, you’ll need to research the surrounding area’s galleries and museums. For English or History trips - theatres, castles and local landmarks will give children an experience that will bring their classroom teaching to life. Cost will, of course, be a factor. Going anywhere together as a large group is going to seem like a dauntingly expensive exercise. There’s also the children’s parents to consider. So, value for money is going to be as important as picking the right location. School group accommodation doesn’t have to be expensive. 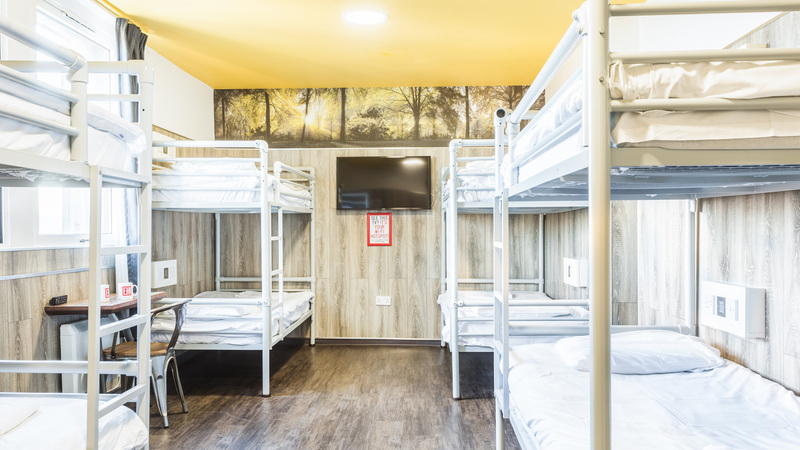 "A HOSTEL FOR SCHOOL TRIPS IS THE PERFECT SOLUTION FOR LOW BUDGET ACCOMMODATION THAT OFFERS A FRIENDLY WELCOME TO GUESTS OF ALL AGES." 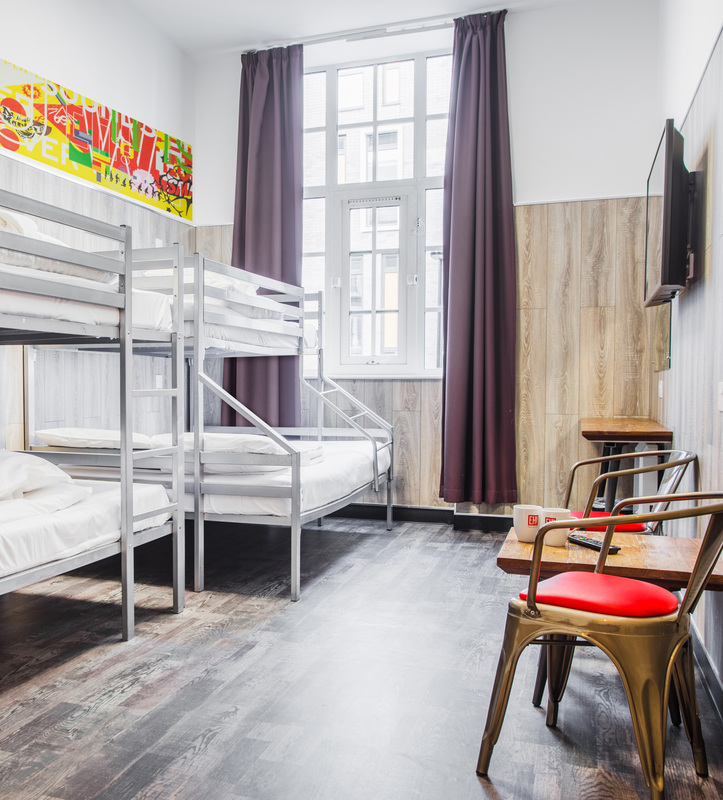 These days, many of the world’s coolest places to stay in top cities are hostels. With choice, comfort, cleanliness and reliability at cheaper options, you can’t go wrong with a good quality hostel in city-centre locations. The old vision of being crammed into communal rooms is no more. These days, school groups can have their own private en-suite dorms at budget-friendly prices. 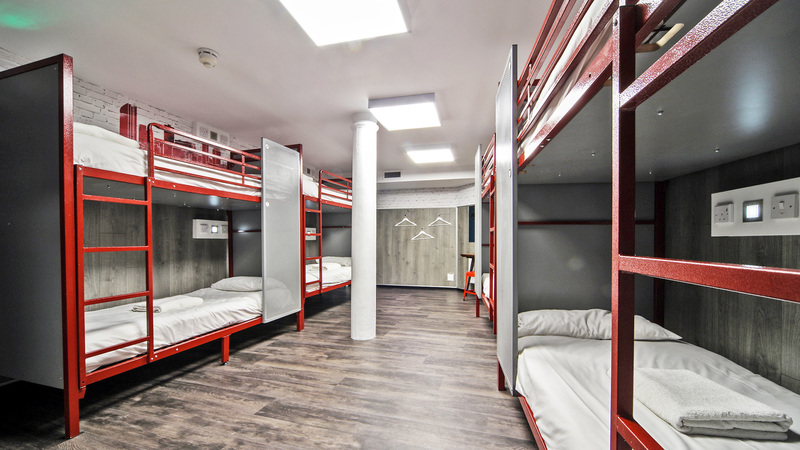 City accommodation is invariably pricey, so reliable hostels are perfect for large numbers of guests who want to save their money for sightseeing and fun group activities. One of the main things you’re going to look for with school group accommodation is the facilities. Good quality facilities that cover all bases are going to give school trip organisers peace of mind. You'll need to safely store the children’s possessions, consider meal options and provide essentials such as towels - if they aren't already included. There’s always going to be at least one person who doesn’t eat at breakfast time or doesn’t like what they’ve got in their packed lunch. So, a vending machine for snacks and drinks will prove very useful. "WE NEED FACILITIES THAT CATER FOR OUR NEEDS, FROM LINEN, TO ACCESS TO WI-FI." Facilities for disabled guests are just as important as the simple things like Wi-Fi, linen, laundry, hairdryers, towel hire and toilets that are easily found and accessible for students of all ages and needs. As long as you pick accommodation that thinks big about the basics, you’ll be able to focus on your school group enjoying themselves – rather than spending your time worrying about the little things. 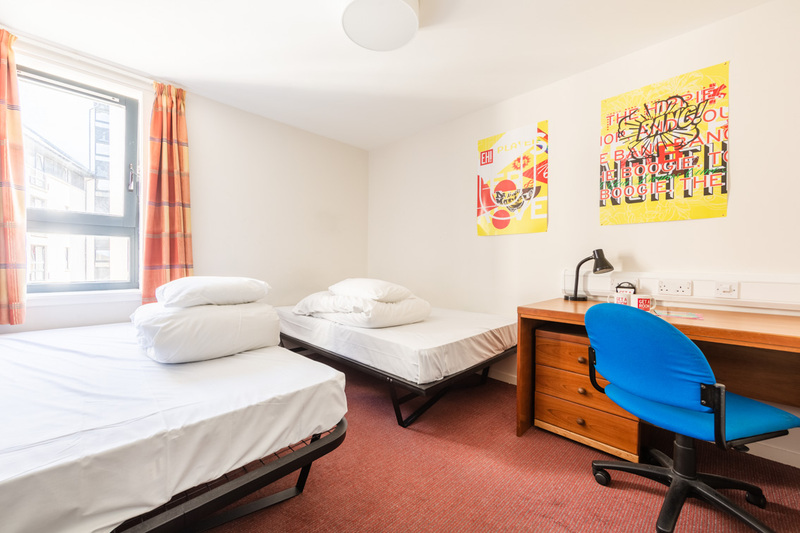 Room choices that suit both students and teachers are vital, so for course leaders, booking a private, en-suite room adjacent to their group is going to provide comfort as well as reassurance. And if you find somewhere that can plan everything from your packed lunches to your tour itinerary, then you’ll have more time to relax and enjoy the trip. Whether you’re looking to plan a science trip, art venture or sports group tour, we can give you the information you need. "WE NEED A CENTRAL LOCATION SO IT’S EASY FOR US TO GET LOTS OF STUDENTS FROM A TO B, QUICKLY AND SAFELY. BEING CENTRALLY LOCATED ALSO MEANS THAT MOST PLACES OF INTEREST ARE NEARBY." 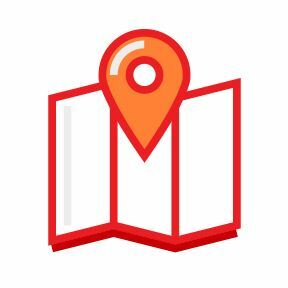 As well as being close to transport links, it’ll be important to choose a hostel location that’s within walking distance of key local attractions, shops and activities. Keeping your school group occupied and energised will be vital. So, long and tricky treks between sights will be a no-no. Euro Hostel is located in a number of cities. Each city has its own selection of sights, activities and fun things to do for school trips – no matter the age-group or subject matter. 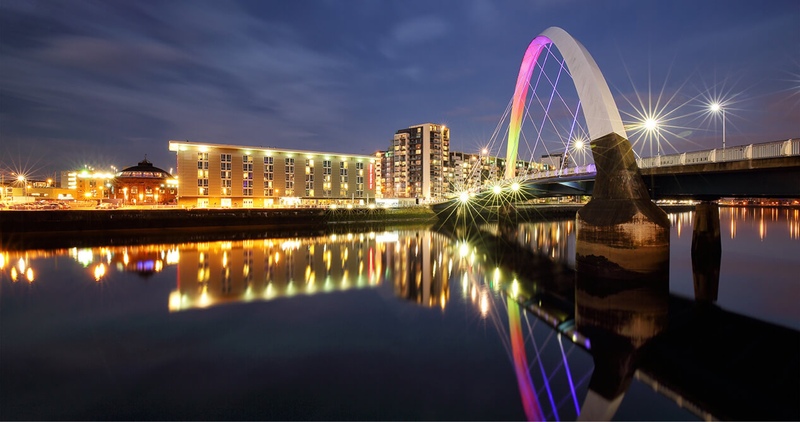 From a giant hamster wheel in the cutting-edge BodyWorks exhibition to Scottish Football Museum tours and historical monuments that attract visitors from all over the world, Glasgow has a wide range of sights and subject matters to keep your school group entertained and inspired. 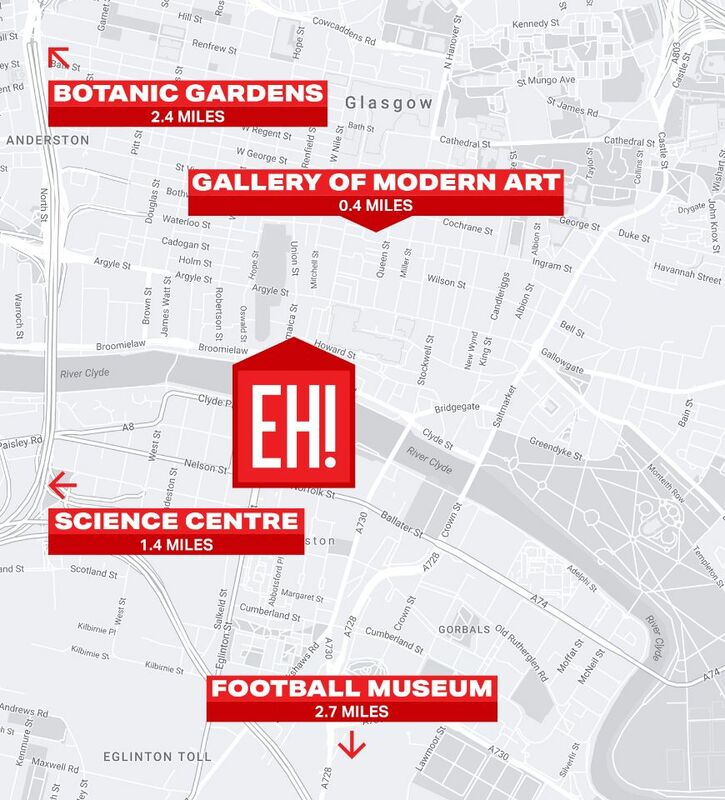 The Glasgow Science Centre is only 1.5 miles away from Glasgow Euro Hostel. School groups will be in their element here, where they can immerse themselves in interactive science shows, get involved in workshops and challenge their bodies as well as their minds in one of the world’s best planetariums. The Glasgow Science Centre has everything to keep them (and you!) entertained, from a giant hamster wheel in the cutting-edge BodyWorks exhibition to Scotland’s biggest IMAX Cinema. Educational 3D films show throughout the day and include Under the Sea, To the Arctic and A Beautiful Planet. The Scottish Football Museum stadium tour allows visitors to experience the underground roadway, team changing rooms and walk down the tunnel of Hampden Park. Guests also get the chance to strike a ball in the Hampden Hotshots gallery and have the shot speed electronically measured. We can guarantee this will spark enough competitive energy to keep the kids entertained for hours – and quite possibly the adults, too! If it’s outdoor adventures you’re after, Glasgow Botanic Gardens is renowned for its tropical plant collections and architecturally impressive glasshouses – the most famous of which is Kibble Palace. Or if the sunshine can’t be guaranteed for the time of year that you’re planning your school trip, the Loch Lomond Aquarium is home to the largest collection of sharks in Scotland, the only Cow Nose Rays in Scotland and family favourites - otters Lily, Pickle and Cub. Chat with our friendly team at Glasgow Euro Hostel to figure out your best route for the day. For historical sights, The Glasgow Necropolis attracts visitors from all over the world. While just a 12 minute walk from Euro Hostel Glasgow, George Square is home to historical buildings and an important collection of statues and monuments. Daily tours of the Glasgow City Chambers take place here between 10.30am and 2.30pm. Art students will revel in Kelvingrove’s 22 themed, state-of-the-art galleries and 8,000 objects on display. One thing’s for sure, you’ll never be struggling for itinerary ideas with a school trip to Glasgow. If you need some inspiration, our Top Attractions in Glasgow 2018 is full of pre-trip research. Did you know that Scotland is home to the longest indoor real snow slope in the UK?! Snow Factor is open all year round and has dedicated teaching for snowboarding as well as skiing and an instruction slope for all ages and abilities. From ‘bear cubs’ to ‘snow leopards’, private lessons are available as one-to-ones or for groups from 4 years old to 13+. What’s more, the venue has sledging, giant indoor ice climbing walls, and a Bavarian themed restaurant with sharing platters that pack in three types of gourmet sausage, guaranteed to warm your school group right up. Mini scientists can marvel at monkeys, marmosets, parrots, snakes, frogs, tarantulas, butterflies and more at Scotland’s indoor tropical rainforest, Amazonia. An array of events take place every day, which include feeding and animal talks, as well as handling sessions. Amazonia offer educational packages suitable for all age groups from nursery to high school. Tours and handling sessions can be tailored to specific topics and individual needs, including the rainforest, senses, classification, minibeasts and life cycles. Teacher resource packs are also available for each topic, containing activity suggestions for before and after your visit. Whether they’re being digitally transported from the Amazonia Interactive area into the Amazon rainforest, or sneaking a peak at bats, kinkajou, snakes, frogs and fish in the nocturnal area – this is a school trip your group won’t want to miss out on. Heads of Ayr Farm Park gives your school group the opportunity to captain their own bumper boat, man an electric tractor, master a quad bike, tackle an assault course or test their thrill levels on three giant drop slides in the adventure barn. As for the animals, there’s everything from little critters to large creatures including Ralph the Camel, Troy the Tapir, llamas, ponies, donkeys and goats. The Park is also home to various breeds of monkeys, lemurs and meerkats! Engineers in the making will love Riverside Museum – Glasgow’s award-winning transport museum. Free to enter and explore, Glasgow’s newest museum contains a collection of the world’s finest cars and bicycles and won the European Museum of the Year award in 2013. With over 90 large touch screen panels telling the stories behind the 3,000 objects on display, there’s everything from skateboards to a Stormtrooper. The museum is open from 10am-5pm and group tours can be booked through the website. If you’d like some help cramming in all the sights, chat to our trustworthy team who are available 24/7 at reception. Not only are they locals themselves, they can provide a cracking tour booking service. 2 minutes from Euro Hostel, Glasgow’s first live escape game is great for teambuilding with a twist. Designed for groups of 2-6 or up to 10 in the Witchcraft & Wizardry rooms and with 6 rooms in total, Escape can accommodate teams of up to 34 in total. To beat the live escape game, you and your team must solve many puzzles, riddles, brain teasers and identify clues. Make sure that you set some brain power aside for this one! Glasgow Quay is walking distance from the Hostel and has a cinema, Hollywood Bowl and a tonne of eateries. At Euro Hostel Glasgow, school groups have a wide choice of room options from single private rooms, all the way up to a dorm of 14 – each with their own en-suite and large smart TV, perfect for some downtime before or after exploring the city. We consider keeping groups close together a priority – we will concentrate on sleeping your group on a few floors as possible, with a teacher present on each floor. Or, for a touch of luxury and guaranteed group privacy, our exclusive VIP suites are just the thing to make your group stay remarkable. Suites range from rooms that sleep 6-20 people and come complete with your very own private lounge plus access to our Secret Garden – great for group activities or just getting together after a day of sightseeing. Our Mint & Lime Restaurant is the perfect place for some food and relaxation after a busy day exploring Glasgow and is ideal for group dining. To prepare for the busy day ahead we can offer an all-you-can-eat hot buffet brekkie from 07:00-10:00 for just £5 each. We can also arrange meals in advance so everything is taken care of before your arrival. If a takeaway snack is all you need to make sure you get to your tour on time, that’s fine too - simply help yourself to our full self-service kitchen. Or, reserve seating for dinner in advance. Euro Hostel Glasgow provides everything school groups need for a secure and comfortable stay with us. Facilities include bike storage, superfast unlimited free Wi-Fi, luggage storage, lockers, electronic key card access and a huge area on our 1st floor that’s perfect for group briefings and team activities. Plus, late check-out and early check-in, ‘cos let’s face it – it’s rare that plans go to plan. Towels are provided in private rooms so there's no need for you to bring your own. According to Wikipedia, the world's first international football match was held in 1872 at the West of Scotland Cricket Club's Hamilton Crescent ground in the Partick area of the city. The match, between Scotland and England finished 0–0. From art museums, tours and activities down at Albert Dock, to the largest cathedral in the U.K., theatres and a multitude of sports venues – Liverpool has it all. Liverpool's ongoing urban regeneration and creative vibe makes it one of the country's key cultural hubs. 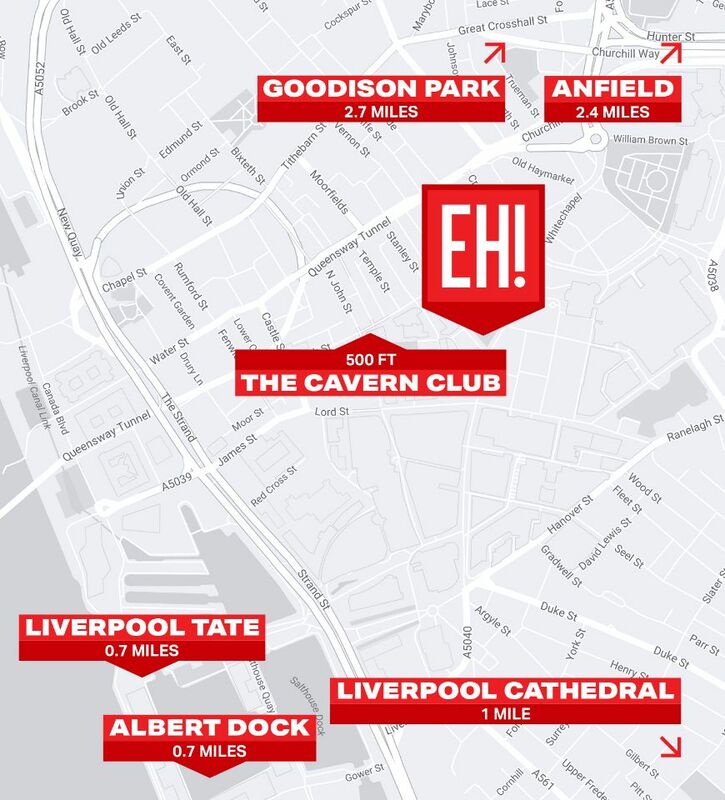 Just 0.5 miles away from Seel Street – one of the coolest streets in the U.K. – Euro Hostel Liverpool is in the heart of the city. 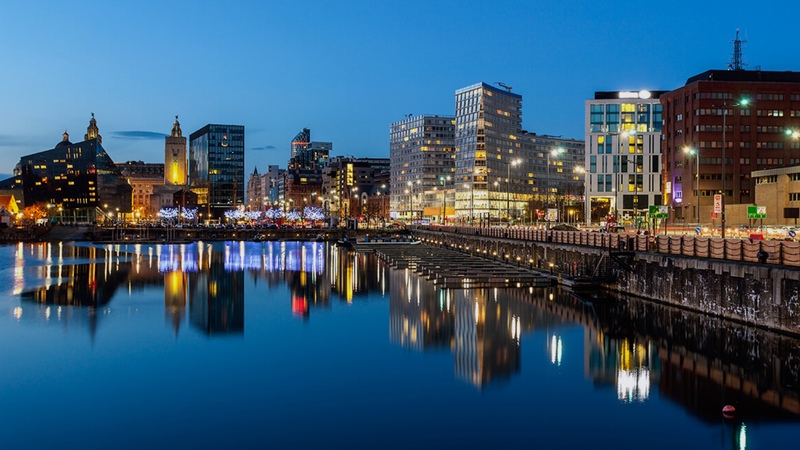 Liverpool's ongoing urban regeneration and creative vibe make it one of the country's key cultural hubs and the perfect place to find a ton of sightseeing. Albert Dock is absolutely perfect for school groups and features the largest collection of Grade I listed buildings in the country. Little historians will gain great insight of Liverpool’s maritime heritage at the Maritime Museum and the city’s slave trade history at the Slavery Museum. Mini artists in the making should head to Tate Liverpool, which is one of the most visited art galleries outside of London and has displayed collections from genre-defining artists such as Andy Warhol and Jackson Pollock. What better place for young creatives to get inspired?! There’s no shortage of museums in Liverpool. Just an 11 minute walk from the hostel, Museum of Liverpool is on the city’s famous waterfront and is as stunning outside as it is on the inside. The largest in the U.K. and the 5th largest in the world, Liverpool Cathedral took 74 years to build and is a must to visit. Conversely, the Liverpool Metropolitan Cathedral is an incredibly modern building with multi-coloured stained glass, captivating interiors and modern works of art. The Liverpool Playhouse is just a 3 minute walk from the hostel, so we can arrange pre-performance meals for your school group. Literary classics like A Clockwork Orange, Othello and A Christmas Carol are on the theatre’s bill, as well as contemporary favourite The Lovely Bones. During downtime, your school group can enjoy coastal walks on one of the many sandy beaches nearby – Antony Gormley’s permanent art installation at Crosby Beach will add a touch of culture to your extra-curricular trip. Did you know that Liverpool has more parks than Paris?! From Lime Street (a 7-minute walk from Euro Hostel Liverpool), you can grab the number 75 bus and head to the locally loved Sefton Park. It has a whopping 200 acres of parkland and a programme of events throughout the year including a Christmas Market. Aside from being a creative hub, Albert Dock has a range of restaurants and cafes plus the world’s largest Beatles exhibition, which includes imagery, memorabilia, video interviews and an interactive Discover Zone. ODEON Liverpool ONE has an IMAX 3D screen perfect for free time, just a 4 minute walk from Euro Hostel Liverpool and Anfield is the 6th largest football stadium in England, with Matchday Tours and Legends Q&A days that are great for sports groups. At Euro Hostel Liverpool, we have a wide choice of room options that are perfect for school groups and we will always try to allocate groups close to each other – making sure that your peace of mind as a course leader is taken care of. For ultimate comfort and privacy, we have exclusive Mini Suites for up to 6 people and VIP Suites for up to 8 people – each with their very own en-suite and separate lounge area, making them the perfect place to take a well-earned breather before your next outing. As for the group leaders, we offer private, single occupancy en-suite rooms, as well as private rooms with bunk beds for up to 8 people. Our Hatch Restaurant is great for whipping up group meals and breakfast in the morning. We have an all-day menu that we serve til 21:00 and FYI, the burgers are our speciality. As well as a range of meal deals, we can also arrange group meals for your school trip in advance so everything is taken care of before your arrival. That includes breakfast, packed lunches and 3 course dinners - all at great group rates to set you up for the day ahead. We have everything you need for a secure and comfortable stay with us. Facilities include superfast unlimited free Wi-Fi, luggage storage, lockers and electronic key card access. Our “Downstairs at the Hatch” is a brilliant bolthole for your group to have day trip briefings, teaching sessions or even just a breather. Safety and supervision is all taken care of with our CCTV and 24-hour reception team – who are also on hand to recommend activities during your visit and arrange tour bookings too. Or, you can head to our Liverpool Places of Interest pages and Liverpool Top Attractions blog post for some pre-trip tips. The Liverpool and Manchester Railway (opened on 15 September 1830) was the first railway to rely exclusively on steam power and the first to be fully timetabled. With the recent Great Exhibition of the North taking place throughout the summer of 2018, the region is finally getting to showcase its vast selection of world-class art, culture, design and innovation. It’s an exciting new era for the North of England and more than ever, a perfect time for school groups to experience Newcastle’s cultural offering. Less than a mile from Euro Hostel Newcastle, the Centre for Life is one of the U.K.’s prime destinations for budding young scientists. Life's schools' programme aims to provide 'hands-on, minds-on, hearts-on science education'. An educational trip to Life typically includes a curriculum-linked workshop, plus time to explore the Science Centre. The venue will plan the day for your school group and give you a schedule when you turn up, to make sure your school trip goes without a hitch. Playing a significant role in the British industrial innovation, Stephenson’s Rocket can be explored by students at the Discovery Museum in Newcastle, where the famous locomotive currently resides as part of the Great Exhibition of the North. Little historians can come up with a solution to a military challenge during an interactive session Exploring Army Innovations, complete an evacuation challenge and learn about the great North East inventors and inventions; while budding scientists can build their own rockets, test their circuits or shipbuilding skills and construct a bridge on a budget. Advanced bookings for group visits to the Great North Museum include free admission, a pre-booked guided tour lasting 45 minutes to 1 hour and a £5 refreshment voucher for the driver! Wonderful workshops are available for history programmes, science programmes and early years as well as foundation stage. The students will be able to investigate mummies, ancient archaeology, the Ice Age to the Iron Age, evolution, fossils and the great galaxies – to name just a few. Constellation tours and space exploration takes place in the venue’s Planetarium and the Bio Wall in the Living Plant section of the museum contains hundreds of creatures, which come to life through a mixture of touch-screen technology and hands-on investigations. 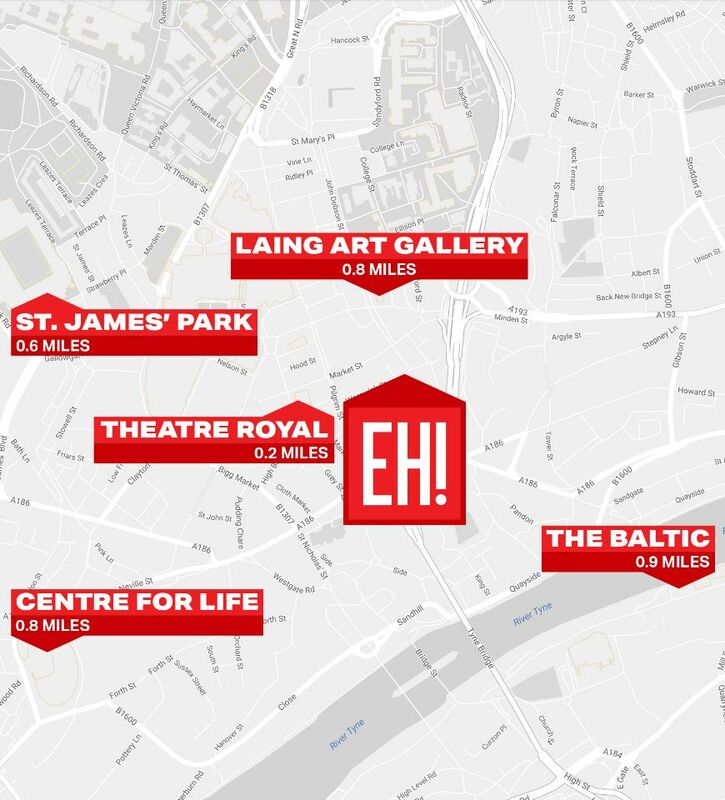 World-renowned art galleries such as Laing Art Gallery, the Biscuit Factory and BALTIC Centre for Contemporary Art are all a short walk from Euro Hostel Newcastle. For the bookworms, The National Centre for Children’s Books is close to the city’s newly regenerated quayside and showcases unique exhibitions, lively events and playful activities that bring children’s books to life. A 4 minute walk from Euro Hostel Newcastle, the Theatre Royal runs performances of everything from Cats, to Stomp, Sherlock Holmes, An Officer and a Gentleman and – our personal favourite – The Play That Goes Wrong. Join us in the Ware Rooms for a pre-event meal before enjoying the musical or play of your choice. Segedunum (meaning ‘Strong Fort’), was built to guard the eastern end of Hadrian’s Wall. Housing 600 Roman soldiers, the fort stood for almost 300 years as a symbol of Roman rule, and a bastion against barbarian attack. Today, it is the most excavated fort along the Wall with surviving foundations of many buildings and part of the Wall itself. The 35-metre-high viewing tower gives visitors amazing views across this World Heritage Site and inside, a large interactive museum exists to transport drama, history and art students back to the past. Children can learn about daily life in the fort using replica artefacts; experiment with prehistoric pottery making and pretend to be new recruits in the Roman Army. Only a 15 minute drive from Euro Hostel Newcastle or 20 minutes with the metro, pre-history adventures await! Prepare to delight your school group with everything from archery to a dragon quest, medieval games and broomstick training at the 11th Century Alnwick Castle! There’s storytelling, craft classes, battle of the Barbican re-inaction and the opportunity to qualify as a Junior Wizard by gaining a Provisional Broomstick Flying Licence in the exact spot where Harry Potter was filmed taking his first flying lesson in the Philosopher’s Stone. Group trips can park their coach for free and discounted admission is also available. Alnwick Castle will be a magical experience for children of all ages – teachers beware of spell-casting on the bus home! Beamish Museum is an open-air, North East living history museum, telling the story of life in the region during the 1820s, 1900s and 1940s. School groups can experience how families lived leading up to WW1 by entering the 1900s town, colliery and pit village, 1940s farm, and 1820s Pockerly – where groups can visit houses, explore the gardens and take a ride on a Waggonway. Learning activities include life in the infant classroom, work in the rope factory and cure-finding in the chemist’s shop – amongst many others. At Durham Cathedral, EYFS and primary school children can pretend to be a monk, hear about Viking raiders, have fun with an Amazing Angel or Gruesome Grotesque crate! While secondary school students will benefits from trip sessions that bring learning to life in a 1,000 year old classroom – look at ratios and geometry, consider the demands of daily monastic life or the impact of WW1. Open-air learning also takes place with a unique orienteering challenge on the city’s riverbanks and within the woodlands. A 17 minute drive from Euro Hostel Newcastle, the Angel of the North is the UK’s most famous piece of public art. Stop off en-route to Beamish Museum and Durham Cathedral for a day brimming with history. On Gateshead’s Quayside, aspiring artists will relish in the Baltic’s six floors of contemporary art and cutting-edge exhibitions, and mini musicians will love landmark live music venue, Sage Gateshead. Sightseeing boat tours can be booked from the banks of the Tyne and the Millennium Bridge is a sight to behold (especially at night) as the world’s first and only titled bridge. Edinburgh is an extremely popular day-trip for school groups and a return journey can be made from Newcastle in a day. 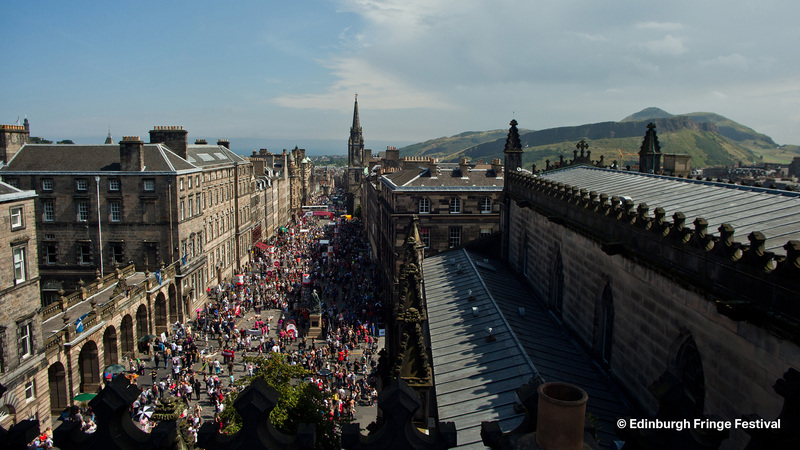 Have a read of our city-centre sights that are perfect for school trips in Edinburgh below. There’s no doubt that big kids and small children alike will find something they love in Newcastle. Have a look at the Top 10 Historical Attractions in Newcastle for even more school trip inspiration. From a 17-screen IMAX cinema and Namco Funscape in the Metrocentre (Europe’s largest covered shopping and leisure centre), to boutique bowling at Lane7, space-themed crazy golf at Mr Mulligan’s, Battlezone Laser, 950m multi-level Teamsport Go Karting and a Better Extreme trampoline park – Newcastle has everything your school group needs to relax or let off some steam during downtime. At Euro Hostel Newcastle, we have a huge choice of accommodation options for groups. We have private, en-suite rooms for up to 8 people, mini-suites and even VIP suites with their own private lounge for up to 14 people. We’ll also do our best to allocate groups and its leaders close together where possible. Single, twin and triple private rooms are available and are perfect for course leaders to have their own privacy but still be close enough to keep an eye on the group! We’ll provide everything you need for a clean, comfortable and enjoyable stay with us. We have luggage storage and lockers available, as well as bike storage, electronic key card access and laundry facilities. Plus, our building is non-smoking and equipped with CCTV and a 24-hour reception, so safety and supervision is always a priority. Our electronic key card access ensures that all areas of the hostel remain safe and secure at all times of the day and night. There’s free unlimited Wi-Fi throughout the hostel bedrooms, reception and bar and pool tables will keep busy hands occupied during downtime, while our Bean Bag Room is great for group get-togethers either during school or free time activities. At Euro Hostel Newcastle, we can provide packed lunches for your school groups as well as catering for any allergies or specific group requests. For group dining, your group can join us for any meal of the day at any time that suits you. We can open early for your breakfast needs and reserve seating for dinner times, simply let us know what works for you and we’ll always do our best to make your school trip as stress-free as possible. Lucozade (originally called 'Glucozade') was invented by William Walker Hunter in 1927 in Newcastle. Euro Hostel Edinburgh Halls will be your ultimate place to be to soak up the selection of summer events on offer. Many of the attractions in Edinburgh will offer school group visits all year round, including private tours and discounted group admission rates. Open from June to August, Euro Hostel Edinburgh Halls will be the perfect base for some sunny, outdoor learning – whatever the subject matter. 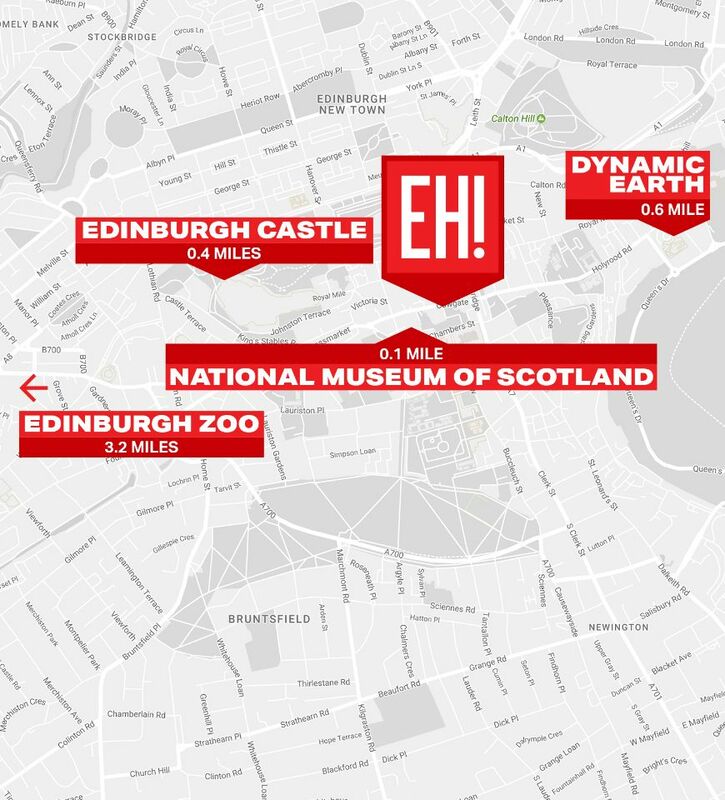 There are many galleries and museums for aspiring artists, as well as the must-see Edinburgh Castle and dungeons for mini historians and Edinburgh Zoo, Deep Sea World, Dynamic Earth and Edinburgh Butterfly & Insect World for young scientists and geography enthusiasts. Edinburgh Zoo is accessible by bus, which runs every 10 minutes from South Bridge, just a 3 minute walk from the hostel. Even more reason to visit the Giant Panda Exhibit, Penguins Rock and wee beasties. We can guarantee that the Blue Poison Arrow Frogs will put a smile on your kids’ faces! The award-winning Portobello Beach is just a few miles from Edinburgh city-centre and is famous for hosting international volleyball competitions and triathlon event as well as kayaking and a community-ran coastal rowing club. An independent town until 1896, Portobello retains its unique character and sense of identity. School trips can enjoy the Victorian swimming pool, which features an original Aerotone and Turkish baths. Follow the Water of Leith on the hidden 12 mile walkway through the heart of Edinburgh, where experiential learning opportunities and popular interactive river exhibitions are held which include river dipping, sensory and discover walks, shadow pupper art workshops and drama activity trails. Just a 15 minute walk from Euro Hostel Edinburgh Halls, Holyrood Palace offers a range of interactive workshops, tours, learning activities within the Queen’s official residence in Edinburgh. Bring history to life exploring the Palace's close associations with some of Scotland’s most well-known historic figures such as Mary, Queen of Scots and Bonnie Prince Charlie. During the busy Festival period, Euro Hostel Edinburgh Halls can offer you choice and comfort at budget-friendly prices. We have private apartments from small groups of 3 right up to school groups of 12. All our rooms are private, lockable, modern and clean – ideal for privacy, security and keeping your group within the same block. Our large reception area or courtyard can be used to gather before your trip or to re-convene afterwards. For creating your own packed lunches or evening meals, each apartment kitchen comes fully equipped with utensils, pots, pans, crockery and cutlery at no extra cost. Or, we can happily provide your school group with a take-away Breakfast Bag and prepared packed lunches. You’ll also have exclusive use of the lounge area, which will be great for group evening activities such as quizzes, film night – or simply just somewhere where the kids can hang out, be silly and play with their phones (the free Wi-Fi will also help with that!). Our private apartments in Edinburgh will feel like a real summery treat for your school group and the atmosphere in the city will be second to none. We have everything you need for a secure and comfortable stay with us. Facilities include tour booking services, laundry, towels, 24-hour reception and facilities for disabled guests. Plus, early check-in and – more importantly – late check-out, for the ones who always lose something and never get packed in time. Euro Hostel Edinburgh Halls is roughly a 9 minute walk from Waverley Station. The Royal Mile measures 1.81 km. It's approximately one Scots mile long, which is longer than an English mile but hasn’t been used since the eighteenth century. PDF version contains all of the content and resources found in the web-based guide. YES, Give me my PDF!